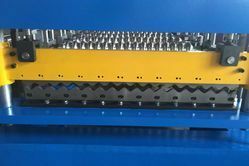 Manufacturer of a wide range of products which include sheet corrugation machine, corrugated sheets making machine and corrugated sheet cutting machine. Matching up with the ever-increasing requirements of the customers, our company is engaged in providing Sheet Corrugation Machine. With rich industry experience and knowledge, we are committed to offering an excellent quality range of Corrugated Sheets Making Machine.